“With a revamped design, more natural feel and new learning app, the DTX402 series sets the standard for entry-level electronic drum kits in the market,” said Steven Fisher, marketing manager, Yamaha Drums. 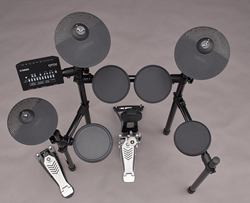 Yamaha today announced the DTX402 series electronic drum kits – the DTX402K and DTX452K – providing beginning drummers with an entry-level kit that will help improve drumming skills and techniques, while introducing intuitive, app-driven challenges and rewards to encourage them to keep playing. Featuring durable components, high-quality sounds and intuitive operation, the Yamaha DTX402 series is also compatible with the free Yamaha DTX402 Touch app for iOS and Android. Improving upon the successful DTX400 series, these new models feature a sturdier design and quieter, more natural-feeling drum and cymbal pads. For increased stability, the redesigned rack provides a solid foundation and more flexibility for the placement of the hi-hat and snare pads. Both models come with the DTX402 module, which comes with 287 high-quality, expressive drum and percussion sounds, 128 keyboard sounds, 10 customizable drum kits and nine reverb types. Different music genre selections, such as pop, rock and jazz, as well as the training and learning functions, are clearly labeled on the module for easy navigation. The module also includes 10 unique built-in training exercises, along with a record function, that improve techniques for drummers of any skill level. The DTX452K features the KP65 kick drum tower and comes with a bass drum pedal. Additionally, the DTX452K includes the HH65, a more expressive hi-hat pad, as well as a three-zone snare pad for head, rim-shot and cross-stick sounds. To supplement these two models, Yamaha has created the DTX402 Touch app available for both iOS and Android devices. Drummers can use this app to fully customize kits to fit their sound and setup preferences, as well as to operate training functions and access video tutorials for practice exercises. The app also features a Challenge Mode to test a drummer’s skill using a variety of music styles with different difficulty levels. The Yamaha DTX402K (MSRP: $799.00) and DTX452K (MSRP: $1,049.00) are scheduled to ship in June 2018.